Liberty University School of Music students learn in the new Center for Music and the Worship Arts. 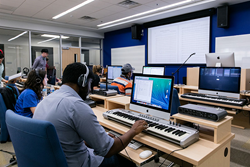 Liberty University School of Music’s new Bachelor of Music in Commercial Music degree received accreditation by the National Association of Schools of Music (NASM) in a meeting of the Commission on Accreditation on June 6. NASM is the national accrediting agency for music and music-related disciplines. While all other music programs were accredited last fall, the commercial music degree was just launched last September, hence the delay in its receiving accreditation along with the rest of the School of Music. All programs within Liberty’s School of Music are now NASM accredited. Liberty’s School of Music is the nation’s seventh-largest school of music and is comprised of two centers — the Center for Music & the Performing Arts and the Center for Music & Worship — as well as the newly-established Department of Commercial Music. The commercial music department serves as the primary training ground for students interested in becoming professionals in the commercial music industry. Liberty offers a Bachelor of Music in Commercial Music with degree concentrations in Artist Development, Film Scoring, Jazz Studies, Recording Engineering and Producing, and Songwriting. Future commercial music degrees are in development, including one in Music Theatre, focusing on training music directors for Broadway and the like. Liberty also offers a Bachelor of Science in Music & Worship: Publishing and Producing degree program under the Center for Music & Worship. To support its growing commercial music program, as well as to provide a platform for both budding artists and music industry professionals, Liberty has launched a new music publishing, producing, and recording division called Liberty Music Group (LMG). Construction planning has begun for a recording studio, the last piece of the school’s massive new facility, Center for Music and the Worship Arts.